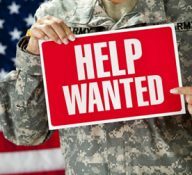 The NWI Veterans Action Council is seeking local employers who are committed to hiring our active National Guard and Reserve members as well as Veterans. If you have a commitment to hiring our Veterans please submit your information through our website to be posted. .
As a local employer, have you considered offering to our Veterans a discount or promotion on the products your sell or service? This is your way of saying thank you to our area active military and Veterans. We would be happy to post and disseminate your companies incentives for our Veterans. Thank you for your consideration. NWI Times Article Rule Change: The Bureau of Motor Vehicles changed its rules last month to waive the drive skills test for commercial driver’s license applicants who completed an approved military driver training program and operated a truck as a regular duty. A written test is still required. If you are a veteran or service-disabled veteran, SBA has resources to help you start and grow your small business. From creating a business plan to finding your first customer, we’re here to help you succeed. or send resume to: nmkarlson@speedway.com. Hire Heroes USA is dedicated to creating job opportunities for US military veterans and spouses through personalized employment training and corporate engagement. Online Magazine for those interested in franchise, very worth your time to view! Earn While You Learn – It’s like a paid internship!